Lindsay here. Sorry for the delay in blogging, but Whit and I now have somewhat of a life here in South Korea. We have friends who call (or text) us to see if we’re up for dinner or why we skipped Korean class. Saturday was a busy, beautiful yet cold day here in Korea. There was an autumnal crisp in the air. It was so cold that I kept looking up to the top of Mudeung thinking I would see snow caps. We woke up Saturday morning with the old Doc Altizer itch to go hiking. So we decided to skip our Korean class where we always sit in a state of perpetual confusion and head to the mountains. It’s not a far trip from our neighborhood. We ride a bus downtown (where we can conveniently stop at Dunkin Donuts for breakfast)and then make a bus transfer to the green bus, 1187, which takes us to the park entrance for Mudeungsan. San is the word for mountain, so roughly translated: Mt. Mudeung. 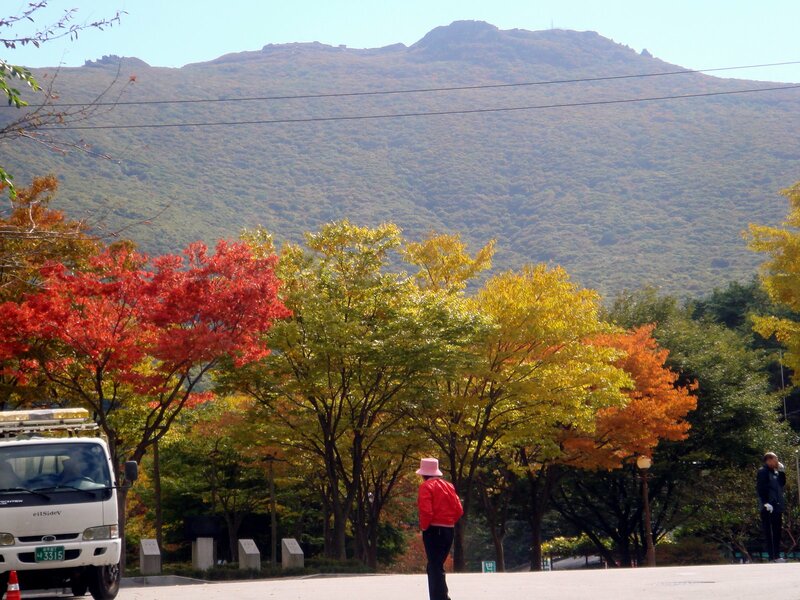 It’s a beautiful mountain, one that lords over downtwon Gwangju to the east. The sight of the mountains always make us feel like we are at home. We hiked for two hours on the mountain, and have decided to go back in two weeks when we are in town to see if we can run to the top. We want to make it our own Shut-In Ridge Run. For all those unaware, Shut-in is the 18-mile uphill trail run to Mount Pisgah held in Asheville each year. I ran it last year for the first time. Whit ran it three years ago. It’s brutal, yet beautiful. So after our hike I did a little shopping while Whit went for a run. Always running, that boy. Saturday night was full of fun. 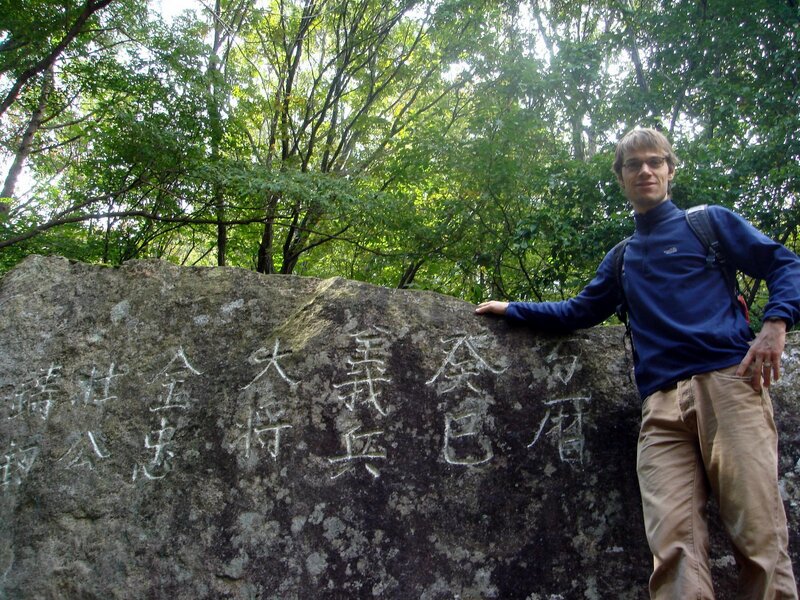 Our recruiter, Dan, from Canada, set up a scavenger hunt for about 35 teachers who live in and around Gwangju. 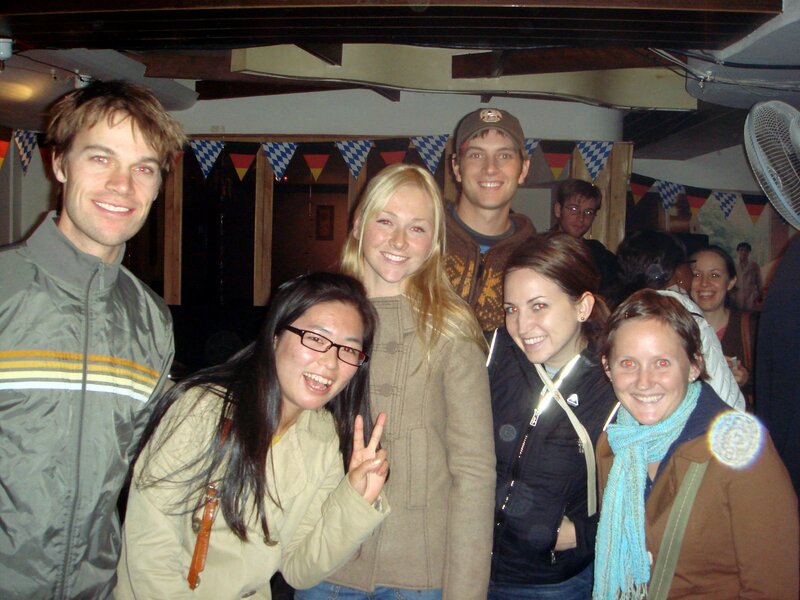 We made fast friends with our group–a young couple from Canada (the guy looks just like Jim from The Office, which makes me really happy); Sarah, from Richmond, Virginia; and a Korean girl Sarah met earlier in the day and invited to come, Hannah. Hannah turned out to be our secret weapon. She knew all the answers and how to find all the things we needed. We bought subway tickets, took pictures of matching Korean couples (couples here like to dress alike to express their love), took photos of ourselves in a photobooth, and found Korean won coins in the year Seoul hosted the summer Olympics (1988). It was a fun night, followed by dinner and hanging out in downtown Gwangju. It’s so nice to make friends and meet people from all over the world. While we definitely have more to blog about these days, we also have less time to write about it while we’re out living it. Hope you have a good Sunday! We’re off to the Gwangju Kimchi Festival!